I thought it was time to give some love to the chickpea cutlet from Veganomicon, especially after the slight dissing I gave it a while back. The truth is that I really don't use cookbooks much anymore because I am always on the hunt for something new I can post on my blog. But I was in the mood for a breaded chick'n burger and I thought the chickpea cutlet recipe would be a good place to start. You'll have to excuse the picture here and the ridiculous bun--they don't do justice to the taste of the final product which was quite tasty. The kids absolutely loved them. The original recipe is posted here, but here are my modifications. 1. Pulse rinsed and drained chickpeas in a food processor until they resemble coarse breadcrumbs. Pulse in oil, then transfer to a bowl and add gluten, plain breadcrumbs, broth, soy sauce, and spices. Knead together for about 3 minutes, until strings of gluten have formed. Divide into 8 and press into 8 thin patties. 2. Mix together soymilk and vinegar in a bowl. Mix together panko breadcrumbs, nutritional yeast, salt, and paprika in another. 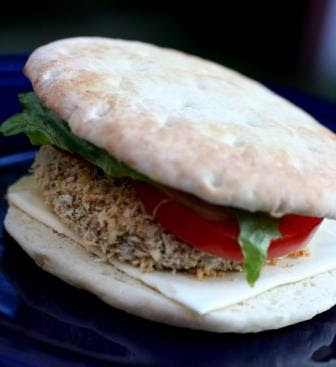 Dip a patty in soymilk, then toss in breadcrumbs. Make sure it gets coated well. Transfer to prepared baking sheet. Repeat with remaining patties. 3. Bake for 10 min per side, or until patties have firmed and breading is lightly browned.